This is the third post about my winter break holiday at the end of July where I flew up to Puerto Montt with Susan for 2 weeks of exploring the region and to visit a friend’s family on the island of Chiloé. Previous posts: #1 Puerto Varas and #2 Petrohué National Park. Puerto Montt was our next stop on the holiday, but mostly because it’s the big city, so had a bigger bus terminal where we could catch a bus to some other national parks in the area. Big mistake! Everyone we’d spoken to in Puerto Varas had said it’s not worth going to, but without our own car we didn’t see any other way of getting to the national parks. This was a city but even the internet was bad. The dogs seemed sadder, not even lifting their heads in the hopes of love and attention. When night-time came it was worse, the shops shut up in the dark and the ugly grey barriers were brought down as guards. This pretty much sums up Puerto Montt and the reason this is not a city that I should ever visit. The grubbiness of a city without any of the Chilean charm. Muerto Montt. Gritty. Sounds lovely. Just what I want on a holiday where I’m trying to escape winter. Quite attractive isn’t quite hitting the bar of what I expected from Chile. Our plan was to use the city as a base for exploring the “pristine pastures” but this only worked to a certain extent. 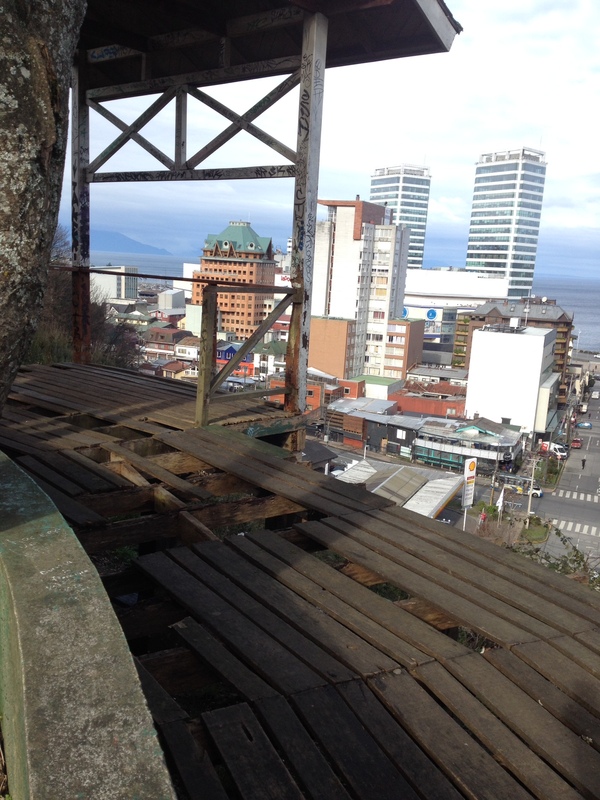 We were rather judgemental of Puerto Montt, but it just kept disappointing us at every turn. The day we arrived we checked in and left our bags at a cheap hotel near the bus station. The internet hadn’t provided us with much in the way of hostel information beforehand, and when we got there we realised why. Even the viewpoint leaves something to be desired! Broken leg, anyone? The hostels we found worked more like hotels, not even having a kitchen. I go to hostels for the reason that I don’t mind sharing rooms and bathrooms, and that I want to cook for myself and meet other people. We explored the city on our way to one hostel to enquire about staying a night there. We arrived and explained we had accommodation for one night, we’d be going to the national park the next day, and wanted to know what else there was to do here to know if staying yet another night was worth it. Turns out the owner didn’t have many ideas or reasons for us to stay here. Stomachs rumbling from the uphill hike, we found somewhere for food and headed back to the hotel to plan what to do for the rest of the week. 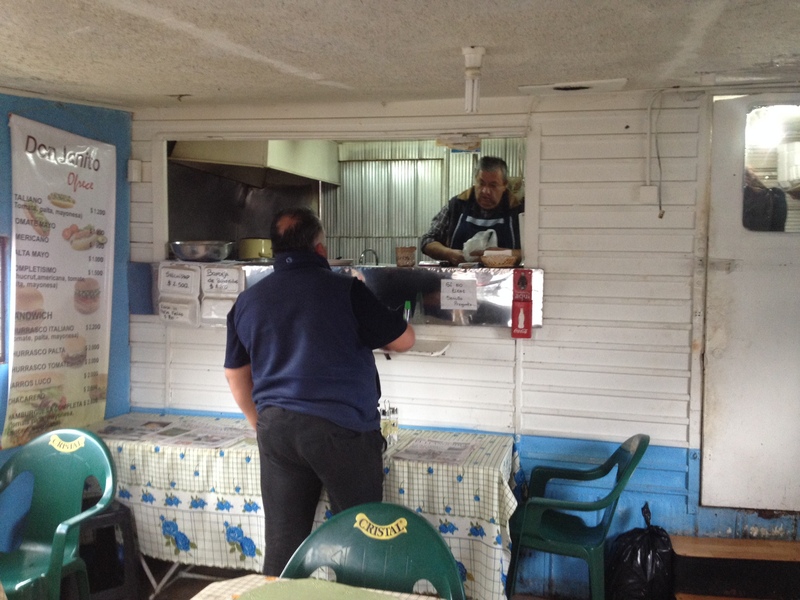 A great little snack shack with burger bar type food and a very friendly owner. Good place to escape the wind too! Scouring the internet we found a nice eco-hostel near a small town called Cochamó, which was also the start of a good trekking location. We weren’t sure if we could still trek in winter, but we needed to get out of the grubby city and in to the countryside. Oh well, we’ll just have to get the first bus the next morning. Let’s just relax tonight and go to the cinema. NOPE, sold out. On a Thursday night. We can’t even do normal things here! Another night in the hotel, another early morning. Eventually we made it to the stunning valley with incredible views, but the changing buses, which we’d checked the times of the day before, had meant that we’d missed out on a day hike. 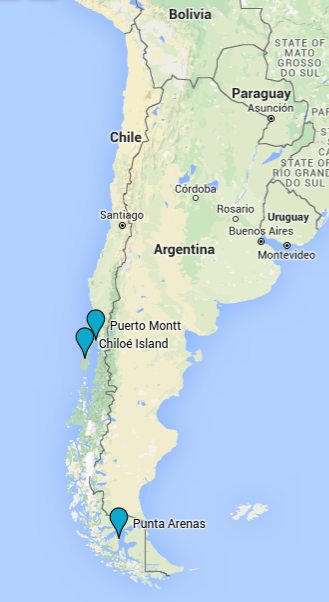 It was time to head to Chiloé to meet up with our friend. I wouldn’t recommend Puerto Montt to anyone unless it’s to get a bus straight back out again. But even with that, be careful you don’t get stuck! Try to have your own car so you can escape to the nicer places surrounding it, that way you don’t have to rely on unreliable buses. I don’t like to leave things on a sour note, so I will finish this post by pointing out some of the redeeming features of Puerto Montt. As it’s in a bay and the city spreads out uphill, it looks nice at night from far away as you can see all the lights. On our early morning bus we caught a glimpse of this just before the city was waking up. 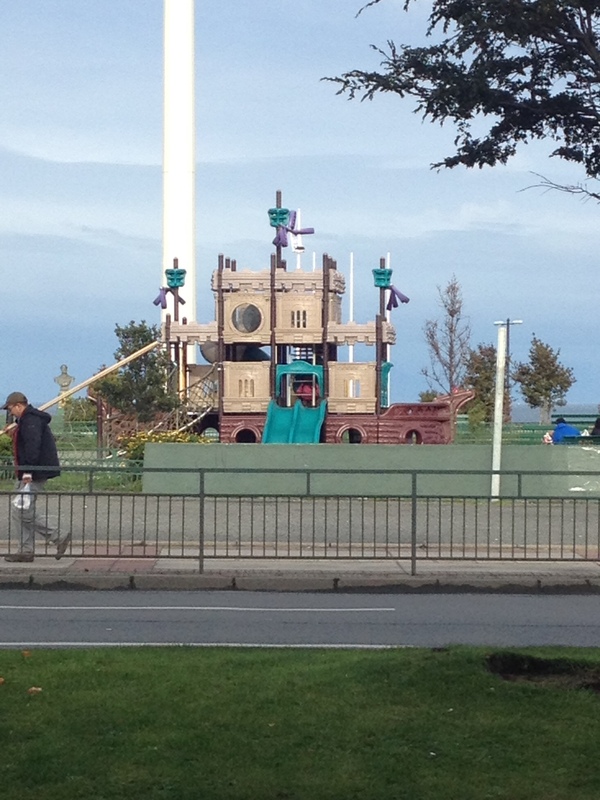 Oh, and there’s a playground in the shape of a pirate ship. Yeah that’s all I can think of. I told you it was bad.